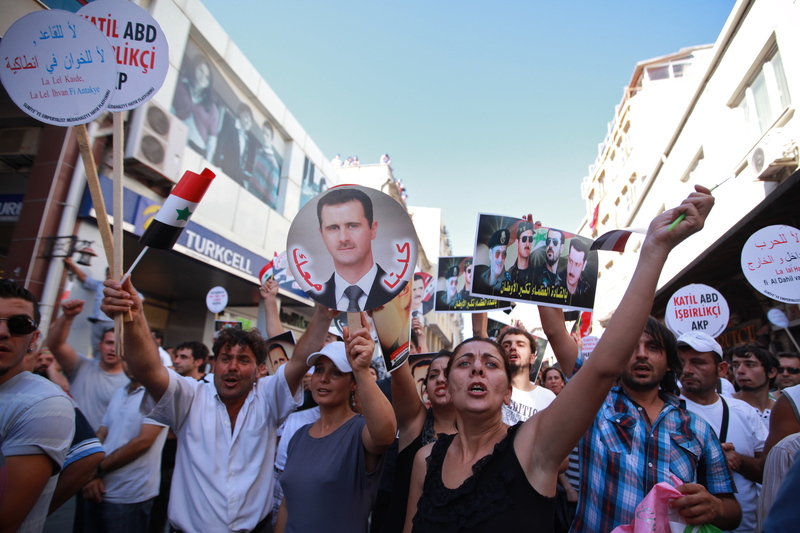 In Antakya, Alawites demonstrate in favour of President Bashar al-Assad, and against the presence of Syrian rebels in the city. Last week I returned from a stint reporting on the Syrian border for The Times. Since my last visit in December, the situation in the country seems to have changed beyond recognition. Back then, the rebels fighting Assad were as much fugitives as guerrillas. Now, they control large swathes of territory inside the country, including the border posts at Bab al-Hawa (Reyhanli) and Bab al-Salam (Kilis). When I visited Bab al-Salam, rebels manned the passport control with bustling optimism. They seemed worlds away from the desperate fighters I had interviewed during my last visit. A dizzying array of groups have sprung up: scores of rebel brigades in different parts of the country, operating under ephemeral umbrellas and shifting alliances, often too fleeting to record. One American academic staying at my hotel in Antakya said he had been following Internet videos announcing the formation of new rebel groups and had given up in August, when his count stood at around 150. The number of refugees has ballooned from fewer than 10,000 in December to more than 80,000 today. Turkish authorities estimate that another 40,000 Syrians are living in the country on tourist visas, mainly in Hatay, or after crossing in illegally and avoiding the camps. Their very obvious presence is causing tension in Antakya, a city with a large population of Alawites, the same sect that forms the backbone of the Syrian regime. Alawites have a liberal and unorthodox interpretation of Islam and have faced centuries of persecution at the hands of the region’s Sunni Muslim majority. In Syria, the seizure of power in 1970 by Hafez al-Assad – an Alawite – turned the tables for the sect. Its members were placed alongside prominent Sunnis in key positions of power. As the regime’s core has shrunk over the years, Alawites have remained its most trusted adherents. The uprising seems to have decisively and disastrously distilled the Syrian regime’s sectarian character. The shabiha, the government’s notorious Alawite militias, are suspected of committing the worst atrocities in the conflict. This background goes some way to explaining the mistrust that Antakya’s population harbours for the rebels in their midst and the growing ethnic tension in the city. Antakya is in some respects a more liberal place even than Istanbul. There is nothing defensive or strident about its secularism, no sense of a culture at war with itself. Girls walk the streets in hot pants and miniskirts, but one does not get the sense that this attire codifies a set of social values to the same degree it does in Istanbul. Now, however, the knots of thickly-bearded, bandaged men sitting in the cafes have made residents increasingly uneasy. Most I spoke to said that the Syrians living in the city were not refugees, but terrorists motivated by religious hatred, resting up in Turkey by day before creeping into Syria to kill Alawites by night. This figure – 2% – I heard several times from rebels who were trying to make the case that the fate of the Alawites, if and when Assad falls, is largely irrelevant. The true figure is closer to 10 per cent: around 2.3 million people. One rebel commander whose brigade operates in an ethnically-mixed region near Hama told me that he had set up barbed wire around all the Alawite villages in his area. He said he had recently acquired 10 rockets, which he planned to fire into one of the Alawite villages. He said that confidence among shabiha operating from there was waning, and he hoped the attack would convince them to abandon the fight. It was the same awful logic the regime used when it tried to bomb, shoot and torture its people into submission, but merely ended up making them more embittered, more entrenched, more determined. 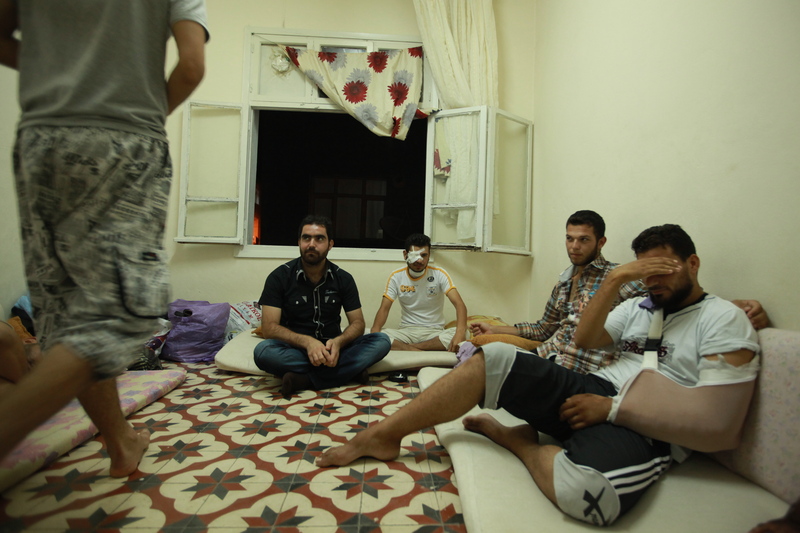 Syrian rebels rest and recover at a rented house in Antakya. For all the changes in the Syrian conflict since my last visit in December, what remains constant is the sense that things are getting inexorably, insolubly worse. The longer the fight goes on, the greater the sectarian enmity will grow, and the more awful will be the reprisal if and when the regime collapses. In the absence of any material Western backing, the rebels are receiving help from patrons whose influence could prove damaging to Syria’s future: Salafists from the Gulf, and a wave of Sunni jihadists from abroad who are fanning sectarian flames. Most rebels commanders say that while they are willing to accept arms and help from anyone, they are not buying the ideas these donors are pedaling. However it’s also fair to say that Syrians, after suffering for decades under a regime that has suppressed religious expression, are sampling the market for new brands of Islam. It’s difficult to see any outside actors being able to impact events in a positive way. In this civil war, the stakes for both sides have become too high for them to stop fighting. If – unlikely as it seems – Assad regains full control, the reprisals against the tens of thousands of Syrians who have bared their faces against him will be massive. If the rebel victory comes, the Alawite minority could face forced expulsion or even annihilation. Several people, including the high-ranking defector Manaf Tlass, have said that the key to ending the conflict lies in convincing Alawites that they will be safe if Assad goes. However, as one analyst pointed out to me, there is no one with the credibility to provide such a guarantee, or manage any kind of orderly transition of power. There are no honest brokers left: every nation with any influence in Syria has picked its side. Instead, what is happening now seems likely to become the latest episode in the sifting of populations that have characterized Middle Eastern and European history for the past century, driven by the rise of nationalism and the forced ordering of the world into nation states. In the Middle East it began with the extermination or expulsion of Turkey’s Christian minorities in the early years of the 20th Century. It continued in Eastern Europe throughout the First and Second World Wars, and then in the Balkans and Caucasus after the collapse of Communism. Elsewhere, colonial rule and homegrown dictators held the ethnic and sectarian fabric in place for much of the next hundred years. Syria, as one analyst described it to me, was a small patch of the Ottoman Empire preserved by the Assad regime’s authoritarianism. One of the things that strikes me most now is how the fate of a small and historically-persecuted minority has become bound up with a brutal regime that has resorted to the mass torture and massacre of its own people. For this reason alone, it is hard to envision Syria continuing with the same mixed ethnic makeup. We went to a fish restaurant on the edge of town where an Alawite wedding was in full swing. Our table looked over the brightly lit party room: An MC and live band pumped out traditional songs in Arabic, bare-shouldered girls in dresses of electric blue or red danced in shifting constellations with tuxedoed young men. Children darted between legs, chasing each other in a parallel world. As we looked on engrossed, our translator said that ‘we could be in Latakia’, and launched into an explanation of Alawite wedding traditions and dating etiquette. Then the band struck up a new song. “Long live our great leader Bashar! We give our blood and our souls to Bashar!” roared the singer.